While CuffLinks is our name, fashion accessories are our business. Perhaps the most stylish fashion accessories are matching men’s cufflinks and tie clip sets. Whether you’re looking for snazzy tuxedo accessories like pocket squares, lapel pins and socks for an extravagant night out or something more distinguished like a personalized tie bar, or leather bag you’ll find it here at CuffLinks.com. The stylish man must pay attention to every detail. Match these fashion accessories with custom engraved cufflinks and you’ll radiate energy to those around you. Choose from our excellent selection of fashionable men’s lapel pins, money clips, tie bars, leather bags, socks and more. If you're looking for a gift, we have great options for no matter the occasion! We even have last minute groomsman gifts like a personalized tie bar and ultimate man cave additions like our game used bar stools from Token & Icons. 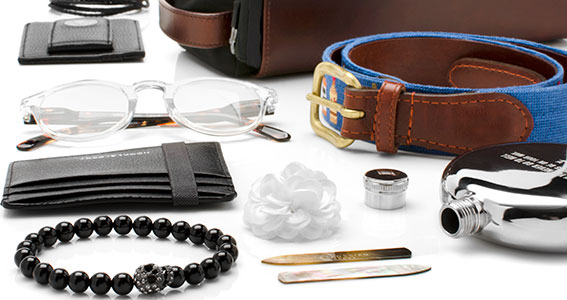 Browse our entire men's accessories department and find unique must have items.